Downtown Jacksonville's Southbank offers a walking tour of some of the area's most historic sites. Several amazing sights, like Dixieland Park, are lost to time. But the stories, and in some cases physical remnants remain. 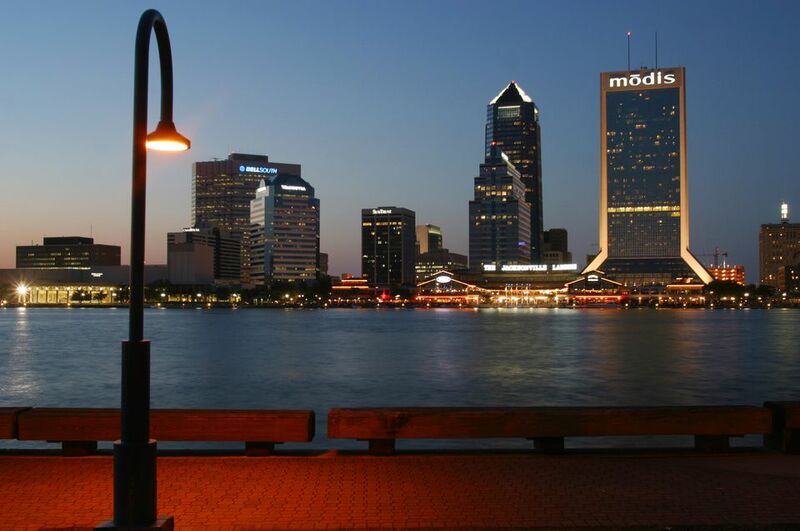 Begin your tour of the historic Southbank at The Jacksonville Landing on the Northbank, which offers a spectacular view of the Southbank from across the St. Johns River. While you're there, check out the statue of Jacksonville's namesake, Andrew Jackson, the first U.S. military governor of the Florida territory. And various plaques situated throughout the property offer a comprehensive account of the city's history. From The Jacksonville Landing, head across the Main Street Bridge, formally known as the John T. Alsop, Jr. Bridge. The 1,900-foot-long, steel-center lift span bridge opened in July of 1941. It's named for one of the city's most popular leaders who rode into town as one of Teddy Roosevelt's Rough Riders and served as mayor from 1923-1937, then again from 1941-1945. At the foot of the Main Street Bridge, you'll see the Jacksonville Maritime Museum, at 1015 Museum Circle. See a massive collection of books, historic documents, artifacts and interpretive displays from the time of the First Coast's 16th century French occupation to its present day as a military hub with two U.S. Navy bases. The museum is open Monday-Friday, 10:30 a.m.-3:00 p.m., and Saturday and Sunday, 1:00-4:00 p.m. Admission is free, but donations are happily accepted, as the museum is a nonprofit organization and organizers are working to raise $1 million to purchase a new waterfront location with dockage to accommodate visiting vessels. A gift shop offers books, art, caps and other gift shop fare. Be sure to bring cash. The shop is currently unable to accept credit cards. Situated at the west end of the Southbank Riverwalk near the Jacksonville Maritime Museum is Friendship Fountain, once the world's largest and tallest self-contained fountain. Construction began on the fountain in 1963 and wrapped in 1965, at a cost of $1.75 million. The fountain pumps 3,500 to 6,500 gallons of water per minute to a height of up to 115 feet, and 265 lights create a spectacular nightly show. After taking in Friendship Fountain, head next door to the Museum of Science and History, known locally as MOSH. History exhibits include Prehistoric Park and Sunken Treasures of The Maple Leaf, which tells the story of one of the largest ships that sank during the Civil War. Downed by a Confederate torpedo, the Maple Leaf remains in the waters of the St. Johns River and is designated a National Historic Landmark. MOSH's Currents of Time exhibit walks visitors through 12,000 years of Jacksonville history, from the time of the ancient Timucua Indians, through the Great Fire of 1901, a World War II Navy hangar, a 1950s home and the 1995 arrival of the Jacksonville Jaguars. Hours are 10:00 a.m.-5:00 p.m. Monday through Friday, 10:00 a.m.-6:00 p.m. Saturday, and 1:00-6:00 Sunday. Entry fees range from $7 for kids to $9 for adults. Next, you'll hoof it across the Acosta Bridge, formally known as the St. Elmo W. Acosta Bridge. The original structure was built in 1921. It was Jacksonville's first road bridge to span the St. Johns River and the state's first vertical lift span. Originally called the St. Johns River Bridge, it was renamed in 1949 for City Commissioner St. Elmo "Chic" Acosta, who convinced voters to approve a $950,000 bond issue for the original bridge. Its replacement opened in 1991, but still bears the Acosta name. Although it's a freeway, bicycles are permitted on the main lanes of the bridge. Next stop is One Prudential Plaza at 841 Prudential Drive. Originally home to the Prudential Insurance Co., the structure now belongs to Aetna and, for 13 years, was Jacksonville's tallest building. It was constructed in 1954 with materials native to the Southeast, including Alabama limestone, North Carolina pink granite and Georgia marble. Major renovations in 1988 and 2002 brought the building to its current look. But longtime locals will always remember the riverfront structure as part of the set for the sequel to the 1954 sci-fi classic, The Creature From the Black Lagoon. If you're touring on a weekday, stop for lunch at Currents Riverview Bistro on the building's second floor. Enjoy beautiful river views and delectable Indian, Thai, Latin and European inspired dishes. And, if you're of age, try the signature cocktail, the Currentstini. Just down Prudential Drive is Treaty Oak Park, once home to Dixieland Park, a jungle-themed entertainment complex featuring dozens of live exotic animals, a 160-foot roller coaster, a huge merry-go-round with 56 wooden animals dubbed "The Flying Jenny," and world famous ostrich races. Dixieland also served as settings in numerous silent films during Jacksonville's heyday as the "Winter Film Capital of the World." Unfortunately, you'll have to simply imagine Dixieland sights. The world-renowned park closed after World War I. Today, Treaty Oak Park, formally known as Jessie Ball duPont Park, remains home to a favorite Dixieland sight and one of Jacksonville's oldest living things: a 70-foot tall, 25-foot wide Live Oak believed to be more than 400 years old. It was given the name "Treaty Oak" by a popular journalist intent on saving the tree from developers. His newspaper article claiming that the tree was the site of a treaty signing by Native American tribes and early European settlers was bogus. But the name stuck and endures even today. Historians still speculate that the site was a favorite camp ground of Seminole Chief Osceola. The Alfred I. duPont Foundation donated the land to preserve the ancient oak in 1964.